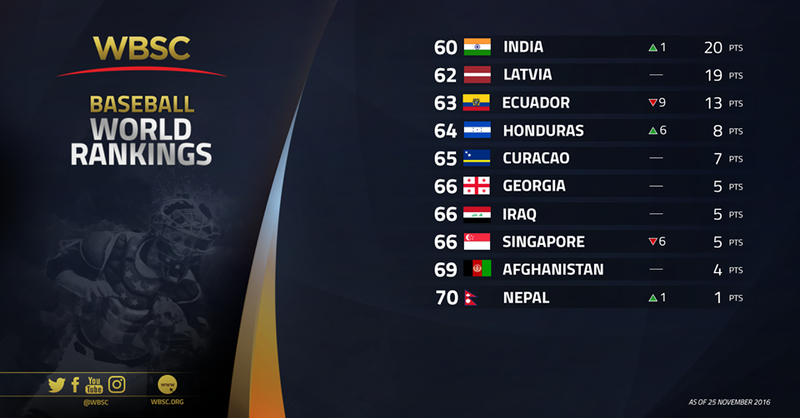 LAUSANNE, Switzerland — The World Baseball Softball Confederation today unveiled the updated 2016 standings in the Official WBSC Baseball World Rankings, which weigh a country’s entire National Team programme (from U-12 to Professional) in international competition over a four-year period (2013-2016). The updated rankings follow the recent results of the U-23 Baseball World Cup® 2016, which awarded baseball’s biggest payout of ranking points this year, the U-18 Baseball World Cup 2017 Americas and Asia qualifiers (COPABE U-18 Pan-Am Baseball Championship and BFA U-18 Asia Baseball Championship), the CEB European Baseball Championship and the CONSUBE South American Baseball Championship, and various international head-to-heads, including the WBSC Global Series 2016. Any points accumulated in the second-half of 2012 have now fully expired. Five continents, Asia, Europe, North and South America, and Oceania, are represented within the Top 12 — the critical cutoff (in 2018) for qualifying for the flagship PREMIER12® 2019, which will be a main qualifier for the Olympic Games Tokyo 2020. Japan has extended its lead as the top-ranked baseball nation after having earned the title of world champion in the U-23 category by winning the U-23 Baseball World Cup 2016 in Monterrey and Saltillo, Mexico, earlier this month. The world title in Mexico, along with 1st Place at the U-18 Asia Championship in September, has propelled Japan’s lead over No. 2 United States from 62 points to 741 points. The United States won the U-18 Americas Championship in Monterrey, Mexico, in October to qualify into the U-18 Baseball World Cup 2017 in Thunder Bay (CAN), and remain at No. 2 in the world rankings. With a bronze at the U-23 Baseball World Cup, the Republic of Korea has solidified its No. 3 position and has advanced within striking distance of the No. 2 spot, closing the distance behind the U.S. from 641 to 105 points. Korea also gained points with a 3rd Place finish at the U-18 Asia Championship, which qualified the nation for the U-18 Baseball World Cup 2017. Chinese Taipei and Cuba remain No. 4 and No. 5 in the rankings. Both nations won silver medals in their respective U-18 continental championships to qualify into the U-18 Baseball World Cup 2017. Mexico has surged to No. 6 in the world, the nation’s highest-ever ranking, following a 5th Place finish in the U-23 Baseball World Cup and 3rd Place finish at the U-18 qualifier, which earned the nation a ticket to Thunder Bay. Mexico’s Men’s Professional National Team also split two games against No. 1 Japan in the WBSC Global Series 2016 at the Tokyo Dome two weeks ago. Venezuela remains No. 7 and finished in 8th Place at the U-23 world championship. Canadian National Teams, not including the Women’s National Team, were idle in international competition in 2016, as the nation dropped two places to No. 8. Two-time defending European champions Netherlands overtook Italy as the highest-ranked nation in Europe, at No. 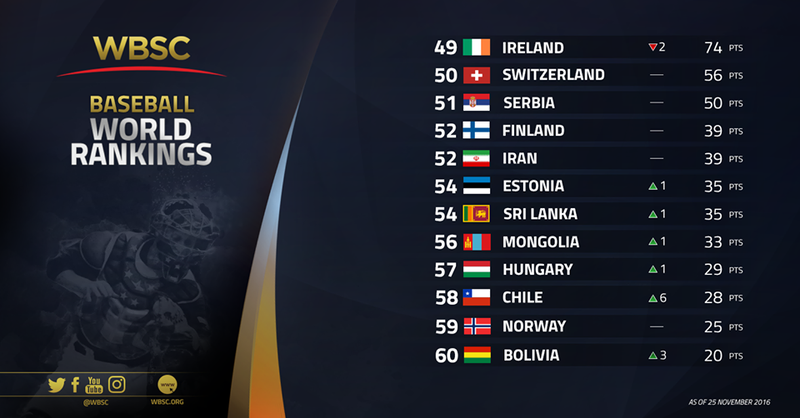 9, with Italy falling one spot to No. 10. A historic silver medal at the U-23 Baseball World Cup advanced Australia two spots in the rankings to No. 11 in the world, placing the nation into PREMIER12 territory. In 2014, Australia fell just a few points shy of qualifying into the PREMIER12 2015. Puerto Rico, No. 12, and Dominican Republic, No. 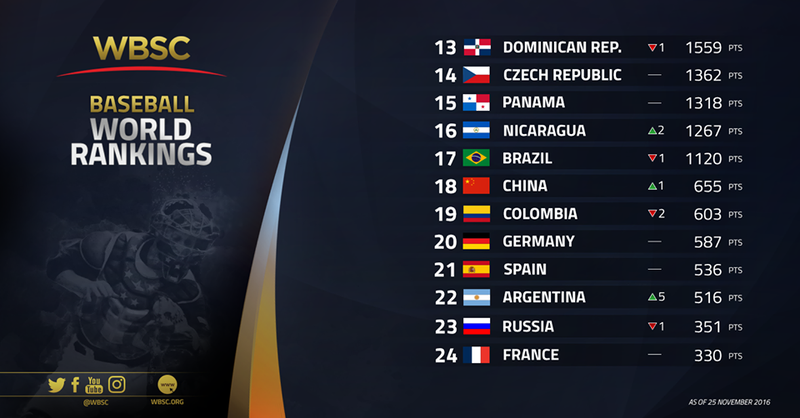 13, each dropped a spot in the rankings, with the Dominican Republic falling out of the Top 12. 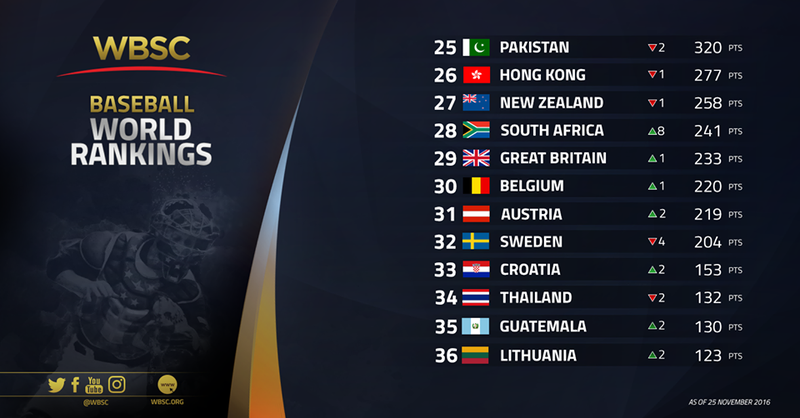 South Africa made the biggest jump in the world rankings, advancing eight places to No. 28, while Peru (No. 42), Chile (No. 58) and Honduras (No. 64) all advanced six places. Argentina, 9th Place finishers at the U-23 Baseball World Cup, advanced five spots to No. 22, tying the nation’s historical high.